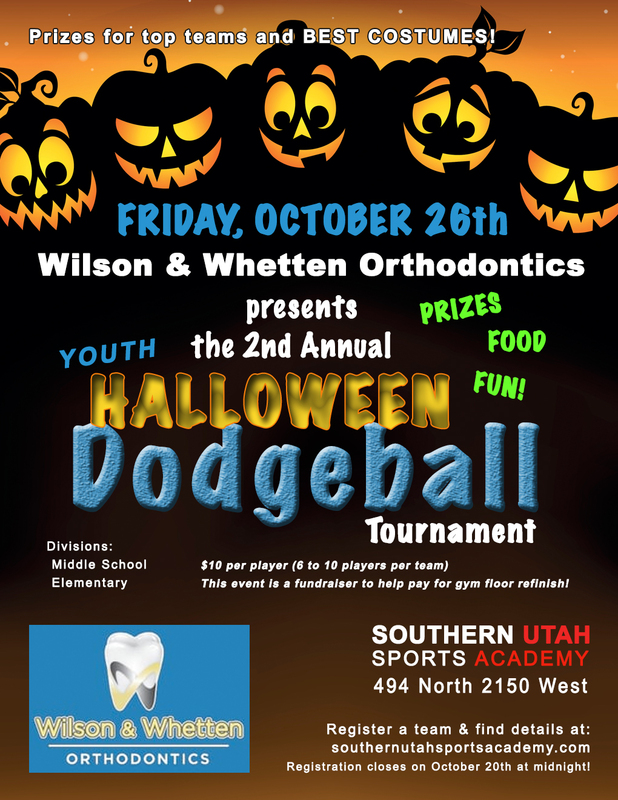 Wilson and Whetten Orthodontics proudly presents the 2nd Annual Youth Halloween Dodgeball Tournament! You don’t want to miss this FUN and EXCITING event! The Halloween Dodgeball Tournament will take place Friday, October 26th, 2018 at Southern Utah Sports Academy, located at 494 North 2150 West. There will be a Middle School division and an Elementary division….Team costumes are encouraged! There will be PRIZES for the BEST costumes and the TOP placing teams. Teams must be registered by midnight on October 20th to play. Sign up TODAY…..for a Spooktacular good time! *Cost is $10 per player. Each player will receive a wristband when you check-in the day of the tournament. You are welcome to pay $60 now as part of this registration, and you can pay for each additional player the day of the tournament. Or you can select the Cash on Delivery option, and pay the full amount when you check-in at the tournament. You will need to pay $10 per player in order to receive a wristband for each player.